Kelly Brook has admitted to retouching her photographs on social media, but insists it's not related to her weight. The 38-year-old actress was one of the celebrity guests at Royal Ascot last week and was pictured alongside boyfriend Jeremy Parisi as they made their way into the racecourse, and eagle eyed followers noticed some slight differences in the photographs published online in comparison to Kelly's personal Instagram page. 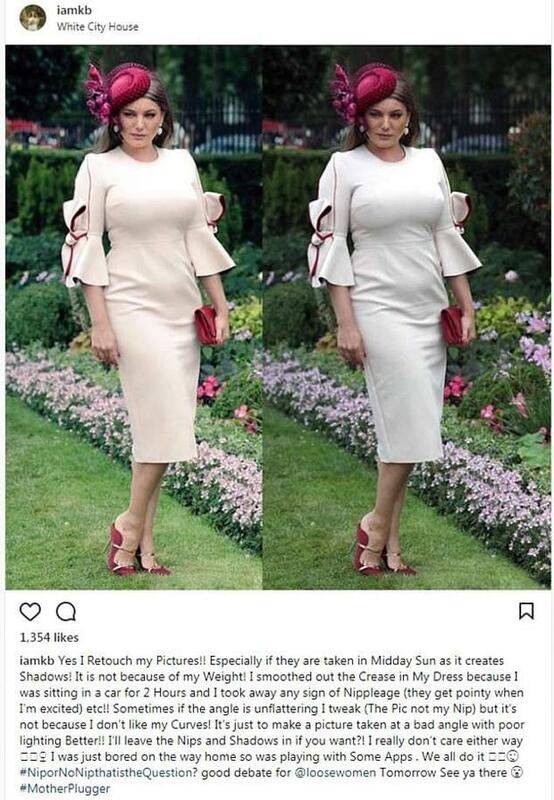 In response, the Piranha 3D star said she edits some pictures, posting a side by side of both for reference, writing: "I smoothed out the Crease in My Dress because I was sitting in a car for 2 Hours and I took away any sign of Nippleage (they get pointy when I'm excited) etc!! "I'll leave the Nips and Shadows in if you want?! I really don't care either way. I was just bored on the way home so was playing with Some Apps. We all do it." She also plugged her appearance on Loose Women today, before deleting the post altogether. Brook shot to the top of best dressed looks from the races in a raspberry fascinator with floral netting by Irish designer Philip Treacy and a cream midi dress bell sleeves and matching trim by Roksanda Ilinčić. She recently said she takes maintaining her appearance seriously as it's the basis of her income. "I think I make the best of myself because it’s my job. I get my hair done and stay fit and look after myself," she said on the ITV panel show earlier last month. "I don’t think I let myself go. When I’m at home on the farm it’s completely different. I go for three days without cleaning my teeth."